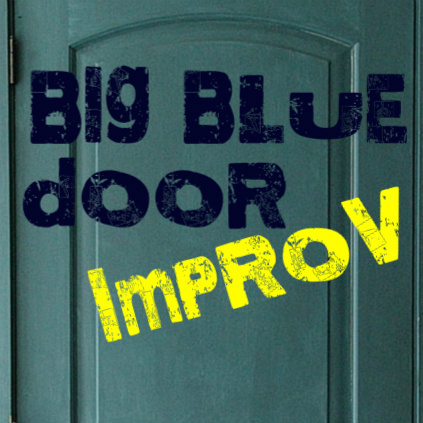 Since 2014 Big Blue Door has presented Charlottesville’s first and only longform improv teams. Check ’em out year by year! First-time BBD performers in bold. The Lady Pills were Charlottesville’s first fully-trained longform improv comedy ensemble, raised through the ranks of Big Blue Door’s improv training program. The Lady Pills performed a Harold run in the Summer of 2014 culminating in a performance at New York’s Magnet Theater. They reformed in the fall to perform in Big Blue Door’s Smallprov run, and to perform at Big Blue Door Unhinged at BON and to perform at Festivus, the Richmond Comedy Festival! Jennifer Slate, Stacey McCormick, Brian Weisbrod, Debby Prum, Larry Goldstein, Maya Hislop, Nauder Namaky, Nik Hayes, and Jude Silveira. Smallprov. For the fall of 2015 The Lady Pills performed a series of shows with two and three-person groups. Jennifer Slate, Brian Weisbrod, Debby Prum, Larry Goldstein, Maya Hislop, Nauder Namaky, Nik Hayes, and Jude Silveira. Hot Dog Water. One of Big Blue Door’s two 2015 winter performance ensembles. Performed with Unusual Suspects. Shawn Hirabayashi, Maya Hislop, Max Hoecker, Debby Prum, Tu-An Truong, and Brian Weisbrod. Unusual Suspects. One of Big Blue Door’s two 2015 winter performance ensembles. Performed with Hot Dog Water. Larry Goldstein, Nik Hayes, Kirk Martini, Nauder Namaky, and Erik Swanson. The Placeholders. Spring monoscene group. Larry Goldstein, Nik Hayes, Maya Hislop, Max Hoecker, Kirk Martini, Nauder Namaky, Erik Swanson, and Brian Weisbrod. Mogli Mogli de Brogli. Summer run 2015. Performed with Plan A. Rosemarie Harper, Nik Hayes, Kirk Martini, Deborah Prum, Brian Weisbrod, and JP Riggle. Plan A. Summer run 2015. Performed with Mogli Mogli de Brogli. Max Hoecker, Nauder Namaky, Maya Hislop, Erik Swanson, and Jessica Pascoal. Catawampus. Fall run 2015. Max Hoecker, Shawn Hirabayashi, Larry Goldstein, Kirk Martini, Rosemarie Harper, Brian Weisbrod, and Deborah Arenstein. OK Stupid was Big Blue Door’s first indy team, put together by Brian Weisbrod and Nauder Namaky with stories, scenes, and even a radio show about their unsuccessful love lives. Performed in summer and fall 2015 and ever since. Brian Weisbrod, Nauder Namaky, plus guests. Sleepover. This is a longform sometimes called Choose Your Own Adventure that is very character-based with elements of monoscene. Performed in the winter of 2016 with The Helix. Nauder Namaky, Brian Weisbrod, JP Riggle, Shawn Hirabayashi, Kirk Martini, Erik Swanson, and Finn Mehigan. The Helix. The is a type of monoscene form invented by a New York improviser named Alex Marino for rehearsals. Big Blue Door premiered it as a performed form. Performed in winter 2016 with Sleepover. Larry Goldstein, Debby Prum, Max Hoecker, Will May, J Lawrence, Deborah Arenstein, Melissa Wender, and Ryan Wender. The Echo. Performed as spring run with Short Term Analysis. This form uses cascades of speech to create and recreate multiple scenes and parallel universes. Larry Goldstein, Deborah Arenstein, Shawn Hirabayashi, Kirk Martini, Finn Mehigan, and Debby Prum. Short Term Analysis. Performed with The Echo. Deconstructing audience stories and interviews. Nauder Namaky, Finn Mehigan, Deborah Arenstein. The Bitter End. One half of Big Blue Door’s 2016 Summer run and continued on into the fall run. Performed with The Administration. JL Lawrence, Will May, Erik Swanson, Sally Trude, Leigh Maxwell, Shell Stern, Keaton Ray, Susan Gorman, and David Luzader. The Administration. Big Blue Door’s summer 2016 run. Performed with The Bitter End and solo in the summer 2016 and at time since. Joel Jones, Nauder Namaky, and Brian Weisbrod. Driver’s Ed. One half of Big Blue Door’s fall 2016 run. Performed with The Bitter End. Larry Goldstein, Deborah Arentstein, Sally Trude, Kirk Martini, Max Hoecker, and Finn Mehigan. Half-Price Candy. One half of Big Blue Door’s winter 2017 run. Performed with Mr Mammal. JL Lawrence, Maya Hilsop, Kirk Martini, Debby Prum, Erik Swanson, Kelsey Keverline, and Todd Kasen. Mr Mammal. One half of Big Blue Door’s winter 2017 run. Performed with Half-Price Candy. Max Hoecker, Sally Trude, Rosemarie Harper, Leigh Maxwell, Susan Gorman, David Luzader, Keaton Ray, and Marjory Ruderman. The Experience. A mixture of storytelling and improv. Ran in winter of 2017. Larry Goldstein, Nauder Namaky, Brian Weisbrod, Finn Mehigan, and Deborah Arenstein. Lemon Cello. One half of Big Blue Door’s spring 2017 run. Performed with Colorblind Astronauts. Todd Kasen, Debby Prum, Sally Trude, Ryan Wender, Finn Mehigan, and Kelsey Keverline. Colorblind Astronauts. One half of Big Blue Door’s spring 2017 run. Performed with Lemon Cello. Larry Goldstein, Deborah Arenstein, Keaton Ray, Susan Gorman, David Luzader, and Marjory Ruderman. Compact Fun. One of Big Blue Door’s summer 2017 run. Performed with Dancing Pilots. JL Lawrence, Larry Goldstein, Will May, Deborah Arenstein, Keaton Ray, Erik Swanson, and Ryan Wender. Dancing Pilots. Susan Gorman, Todd Kasen, David Luzader, Kirk Martini, Debby Prum, and Marjory Ruderman. Dish. An indy team put together by Nauder Namaky featuring elements of monoscene, audience interviews, and montage. With a pick-up group of performers. Feminine Hijinks. Fall run 2017. Performed with Suburban Dictionary. Susan Gorman, Marjory Ruderman, Debby Arenstein, Debby Prum, and Rachel Showalter. Suburban Dictionary. Fall run 2017. Performed with Feminine Hijinks. Kirk Martini, Todd Kasen, Nauder Namaky, Erik Swanson, Will May, Keaton Ray, and Nick Quillen. Feminine Hijinks. Winter run 2018. Returns with fall lineup Deborah Prum, Marjory Ruderman, Deborah Arenstein, Rachel Showalter, and Susan Gorman, plus veteran Kelsey Keverline, plus Jessie Conover. Bunch. Winter run 2018. Veterans Keaton Ray, David Luzader, Larry Goldstein, and Max Hoecker, and Nick Quillen. The Living Room. Spring run 2018. Veterans Keaton Ray, Deborah Prum, Marjory Ruderman, Rachel Showalter, Susan Gorman, and JL Lawrence. Bios here. For Big Blue Door’s 2018 Summer Run we had groups meeting together and mixing and matching for each show. Newcomers D Webster, Tim Gorman, and Steve Sanderson joined veterans Susan Gorman, Debby Prum, Erik Swanson, Kirk Martini, Nick Quillen, Todd Kasen, Max Hoecker, Keaton Ray, Jessie Conover, and Marjory Ruderman. Product Placement. Fall 2018. Features newcomer Rachel Edwards with veterans Marjory Ruderman, Susan Gorman, Tim Gorman, Debby Prum, David Luzader, and Kirk Martini. Directed by Joel Jones. Full bios here. Latte Farm. Fall 2018. Features veterans Deborah Arenstein, Rachel Showalter, Steve Sanderson, Erik Swanson, Max Hoecker, Jessie Conover, and Todd Kasen! Directed by Keaton Ray. Full bios here.